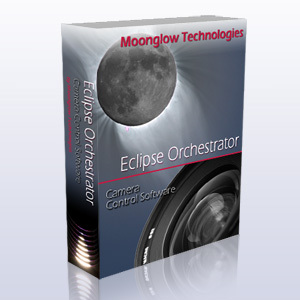 Eclipse Orchestrator makes rapid, complicated exposure sequences easy. Watch the Eclipse, Not Your Camera! Celebrating our 15th anniversary of automated eclipse photography! Version 3.7 released June 15, 2017! We have received a new SDK from Canon that supports up through the EOS RP, and are planning a new EO release in late April 2019. Note that Windows XP is no longer supported by Canon, so we can no longer support XP in EO. EO Pro will not be available to order June 25 thru July 3, 2019. We do not offer EO Pro for sale within one week of a TSE, to prevent customers from waiting until the last minute and expecting technical support while we are away traveling to an eclipse. Download the PDF sales sheet for a quick introduction. This software controls cameras during a solar eclipse or Venus/Mercury transit so that you can be free to concentrate on observing the event visually. Preprogram all exposures using our handy script wizard customized for your exact coordinates and camera. Enter your latitude/longitude coordinates and the software will automatically calculate local circumstances for you. 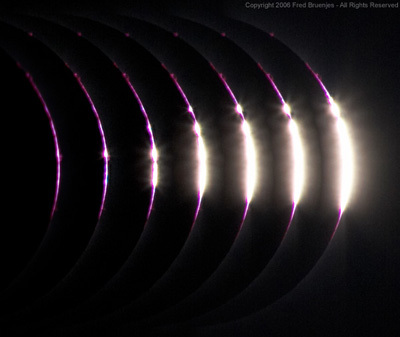 Then, all camera actions can be timed in reference to these specific eclipse events. All features are optional, so the program can be used for as little or as much as desired. Available in two versions, Free and Pro ($109). Throughout this website and the program itself, (P) or (Pro Only) indicates that feature is available only in the paid Pro version. First developed for the 2002 total solar eclipse, it has since been used around the world. Because digital cameras are still in their infancy, extensive rehearsal and testing is recommended to ensure success. This is Windows software, for XP or Vista operating systems. Get detailed information about the event. Connect your camera to a laptop with a USB cable (or Firewire cable for certain camera models). Then build a script of exposures, listing when you want each exposure to occur, and with what settings (shutter speed, ISO, aperture, file type). At the appointed time, Eclipse Orchestrator will send commands over the USB cable to the camera to set those settings and trigger the exposure. The images will be saved to the camera's internal memory card, just as if you were there running the camera by hand. For faster operation, purchase Eclipse Orchestrator Pro, and connect a third-party serial port shutter cable to the camera. The exposure settings still travel over the USB cable, but the shutter trigger command goes over the serial cable, enabling much faster operation. The software is available in two editions, Free and Pro. Downloading Free allows full checkout of the basic features of the program, without any time limitations. For many users, the Free version is all they will ever need. The Pro edition adds numerous features for power users and professional photographers. Free can be upgraded to Pro at any time, without downloading any additional files - just purchase the serial number and enter it into the software for an instant upgrade! Continue on to read about Features.